Get Rid Of Your Old Junk! 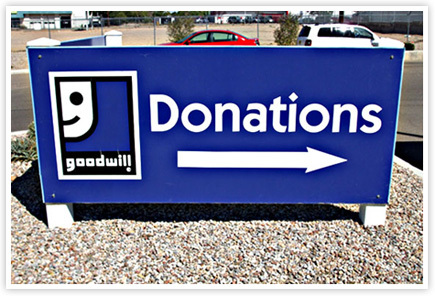 Did you know that Goodwill® earned the support of more than 79 million donors in the United States and Canada in 2011. Thank goodness because Goodwill helps out tons of families in your community that otherwise would not have a Christmas this year, or worse yet not be able to stay warm during the winter. That means your donations can even be saving lives! The donation process is super easy. All you have to do is take your gently used items to your nearest donation center. You will find that some Goodwill locations accept donations of computer equipment and vehicles. However, when donating to Goodwill guidelines need to be followed when preparing your items or deciding what you can donate. Please don’t leave items unattended outside a collection center. You can imagine the mess that this would create. Do not donate broken or soiled items. Honestly, if it is something you would not want to wear in public, why would anyone else? Do not give items that have been recalled, banned, or do not meet current safety standards. For more information about questionable items, visit the Consumer Product Safety Commission. Please keep in mind everyone’s safety. Please wash or dry clean clothing before you donate to a center. Make sure that you test electrical equipment and battery-operated items. Who really has use for an old broken tape recorder? 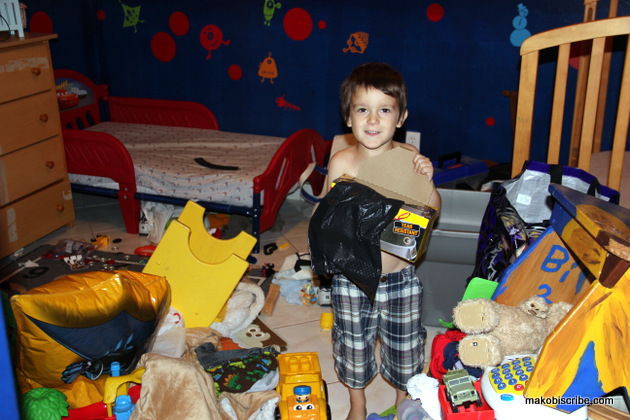 Always include all pieces and parts to children’s games and toys. There is nothing worse than putting together a puzzle to find out it has a missing piece. Check with your local Goodwill Industries agency to determine standards for donating computers and vehicles because the guidelines vary from center to center. Tracking your charitable donations can be fairly easy using a software like It’s Deductible. This is what I use. It is free, and since I own my own business it helps a lot come tax time. By keeping track of your donations as you give them throughout the year, the amount adds up pretty quickly. So far this year I have donated over $4,500 according to the It’s Deductible site. 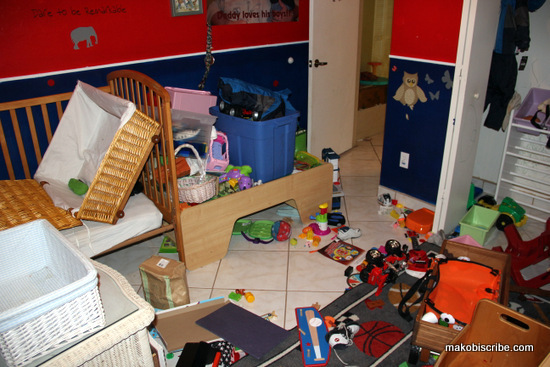 I accumulate a lot of stuff and so do my kids, so we need to make it a point at least once a month to de-clutter or pretty soon all the rooms in the house will look like my boys room. Yes, I know it is atrocious. Unfortunately they have leaked into the next room as well so I know clean up will be a challenge. My kids have more toys than Toys-R-Us. It is ridiculous. This year, Jakobi is old enough to be able to help me pick out which toys he wants to give away. we are in the middle of a room reorganization and the first step to organizing is clean up! This is where I have to call in the big boys – Glad Black Bags. For a mess like this, I will want a strong durable bag that will be able to hold a variety of assorted items and not break. I usually divide into three piles first: Keep, Give, and Toss; but I think I can go straight to the bags and skip the pile step in an effort to save time. I try to teach my boys about giving the excess we have to those who do not have as much as us. Sharing your toys can be a hard lesson for a 2- and a 4-year-old to grasp, but I still think it is an important one to stress over and over. I usually resort to, “We are not getting anymore new toys until you give your old ones away,” then I have them fill up a whole Glad black bag on their own to donate. 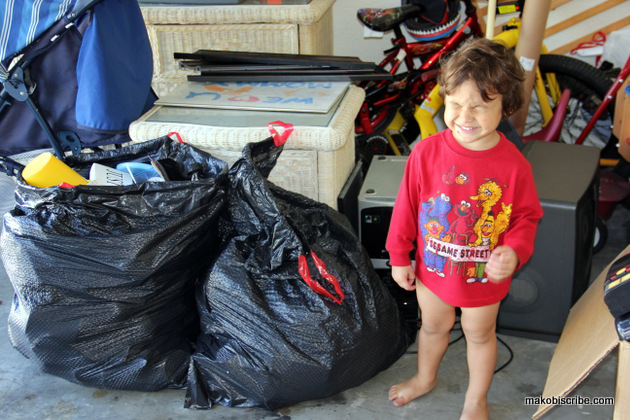 Glad black bags sure made the cleanup process easy, and I was able to get everything picked up in the boys room! I love how the plastic can stretch to the limit with out breaking. I even had room left over in the bag. So, after cleaning up their room, I even tackled my closet as well. I filled up an entire regular bag full of clothes to make room for the next season. So I was sure it would fill up the black bag, but it did not. So I went out to the porch and grabbed some kids toys from out there. Still not full! Amazing. On the trash side, I cleaned the boys room and the porch as well. That was the bag on the right. My next challenge will be to get my husband to organize and clean out his mess. I swear he still has pants from 8th grade. Right now, Glad has a special tab on their Facebook page called, “After the Wild Life” where you can play the ‘Missing in the Mess’ game and sift through virtual trash to find treasure.